CHILI — When the weather begins to cool, the crockpot comes out and chili season begins! Our chili versions vary according to what we have on hand and who is cooking that day, but I’ll share our base recipe. 1. Saute onions in oil until soft. Add peppers and continue sauteing until softened. Add cumin, chili powder, and bay leaf and cook another 2 minutes. 2. Put all ingredients, except corn and garnishes, into crockpot. Let cook on medium for several hours or on high for 2 hours, then on low for several hours or overnight. 3. Add corn for last 10 minutes of cooking time. 4. Serve in individual bowls. Allow each to add garnishes of his/her own choice! 1. You may adjust spices and amounts of each to your taste preference. 2. We are vegetarian, so no meat is added, but we sometimes add vegetarian sausage or “beef” (tvp) to the main portion when cooking, though the beans give a good texture and plenty of protein without the additions. 3. Chili is also excellent served over rice or noodles, and leftovers add a special touch to veggie hot dogs, too! 4. The perfect chili accompaniment is homemade cornbread–recipe coming soon! Mix flour with salt, and one tsp each of basil and oregano. Dredge eggplant cubes in the flour mixture. Saute onion and garlic in the oil until soft. Add the eggplant cubes and sauté until tender, stirring frequently. In a blender, coarsely blend the tomatoes with the remainder of the basil and oregano. Add the tomatoes to the eggplant mixture and heat through. Add 1 cup Parmesan cheese. Add water, if needed, to adjust the consistency. Cover and simmer over low heat for about an hour. 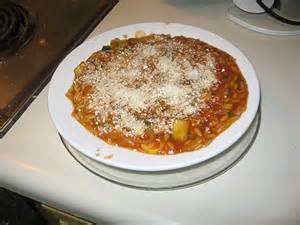 Garnish with remaining Parmesan cheese when serving. This can also be made using a slow cooker (crock pot) Instead of cooking for an hour on the stove top, set the slow cooker on low and cook for about 4 hours. 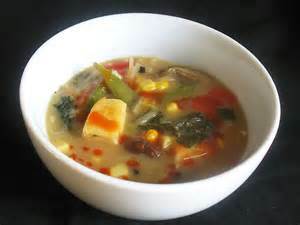 Miso is a fermented soy product that has considerable health benefits. It’s flavors mesh well with many different foods, but are firmly at home with Japanese cuisines. Read more about Miso and it’s benefits here. This recipe is quite simple and can be modified easily. Heat broth to just boiling. Add Nori pieces and continue cooking for 5 minutes. Reduce heat and mix in the miso by adding a small amount of the hot broth to the miso in a cup and blending to make a smooth, thick liquid. Add back to broth and simmer on medium heat about 10 minutes. Add the tofu, scallions, mushrooms, and peas and continue simmering another minute, until heated through. Serve immediately. A soothing Golden Vegetable Soup, reminiscent of Grandma’s Chicken Soup, but in a healthy, vegan version. 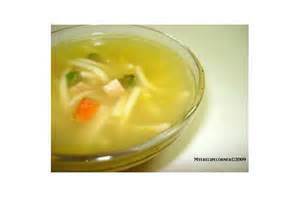 Modify this to your family’s tastes; you can make a golden broth with noodles only, eliminate the oil by sautéing with water, and change out the vegetables according to what you have available. A quicker version can be made using one pound of frozen mixed vegetables, in place of the vegetables given. Recipes for Golden Seasoning and for Vegan noodles can be found by clicking on the links within the ingredients list. In a large pot, blend seasoning into water and put on medium-high heat to bring to a boil. While broth heats, sauté onion in oil until softened, about 3 minutes. Add mushrooms, zucchini, broccoli and carrots and sauté another 3 minutes. Add noodles to broth and boil 3 minutes, uncovered. Add peas and beans and simmer about 3-5 minutes to finish cooking. 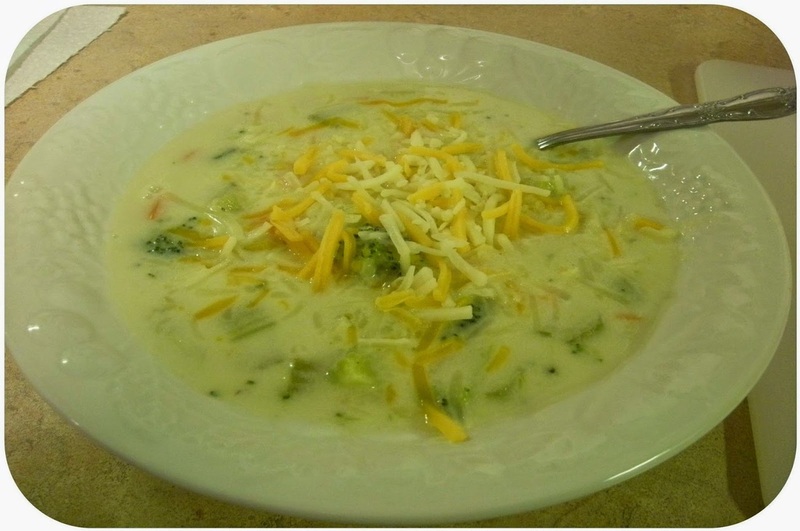 Warm broccoli soup is a very flavorful, comforting meal that can be enjoyed summer and winter. Our family enjoys both of these versions and we adjust them with the extras included below, according to the preference of the day. 1-Saute onion and celery in oil until very soft. 2-Cook broccoli in two cups of water until very soft. Do not drain. 3.Melt butter in large pot. 4.Whisk flour into butter and continue stirring until thickened. 5.Stir in milk and cook over medium heat until thickened. 6.Add 8 oz of cheese and stir to melt. 7.In a food processor or blender, process broccoli in cooking water with onion and celery, to thick consistency, reserving about a cup of small pieces for garnish. 8.Add pureed broccoli to the sauce and cook over low heat for a few minutes to combine flavors. 1-Cook potatoes in small amount of water until nearly soft. Add broccoli and continue cooking until potatoes and broccoli are very soft. 2-Saute onion and celery in oil until very soft. 3-Process potatoes, broccoli, with onion and celery, in food processor or blender until thick consistency, saving a few flowerettes aside for garnish. Serving either version of Broccoli Soup. Here is where you can really make either version truly unique! We usually serve our broccoli soup with a garnish bar: a few of our favorite garnishes set out for each to personalize his or her own soup!